UPDATED: A robot may not injure a human being. BAD ROBOT! UPDATED: We have verified via producer Nick Ryan this is indeed a short, it was shot in LA, and it's currently in post-production. We'll have more for you soon. "Soon every house will have a robot helper. Don't worry, your kids are perfectly safe." I love it! 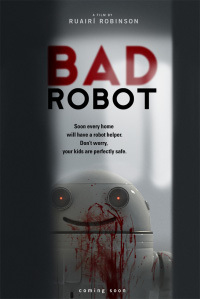 From Ruairi Robinson, the man behind the excellent post apocalyptic short Silent City which starred Cillian Murphy, is back with another film titled Bad Robot which is billed as being a comedic scifi. However, based on the poster, I'm wondering if this is a horror comedy, and between the IMDB entry and the other pages I've found on this, I can't tell whether it's a short film or a feature. 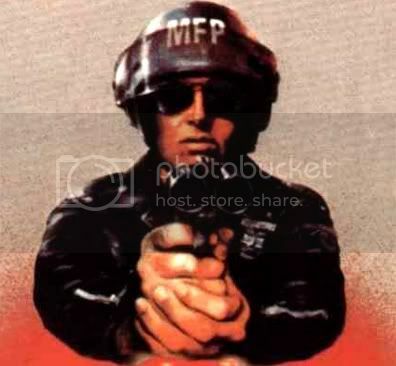 Image Now Films, the Irish production company behind Silent City is also involved. I'm currently attempting to get in touch with the production folks behind this project, so hopefully we'll have more info available shortly. Check out the concept teaser after the break. The animation is spot on. Looks like an interesting consumer robot design, but because Silent City is one of the best shorts I've ever seen period, I'm immediately intrigued. tht is gd. well done character design on the animation there. would hav just chosen a more cinematic background....as opposed to big white nothingness. wish there was a feature length Silent City, i could watch films like that all day long!